Fate, they say, is fickle. 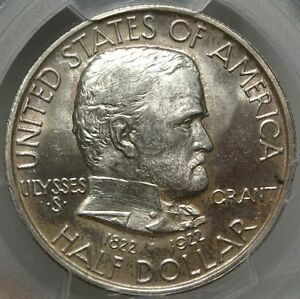 Anyone who doubts this should study the career of Ulysses S. Grant, who rose from utter obscurity to win a prominent place in U.S. history - and also on U.S. coinage. 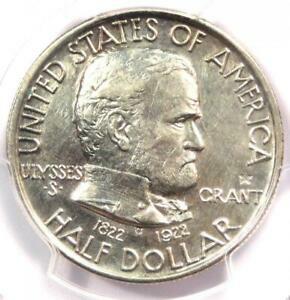 Two U.S. coins, a gold dollar and a silver half dollar, were issued in 1922 to mark the centennial of his birth. Nothing in his early years, however, indicated that Grant might be headed for a rendezvous with fame. 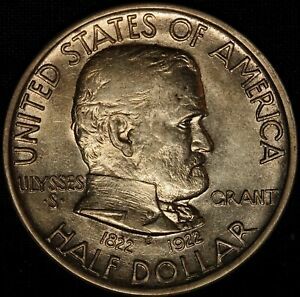 Even "U.S. Grant" - the shorthand form of his name that later seemed so apt - came about more by accident than design. 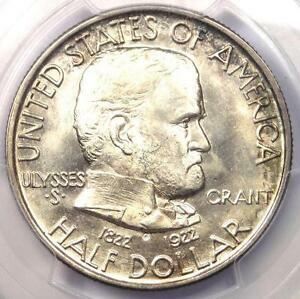 His given name was actually Hiram Ulysses Grant, and his background and upbringing were unremarkable. Born in 1822 near Cincinnati, Ohio, he developed an aversion to his father's tannery business and instead performed chores on the family farm, attaining great skill at handling horses. In 1839, his father secured an appointment for him to the U.S. Military Academy at West Point, New York. Grant decided to reverse his given name upon entering West Point, registering as Ulysses Hiram Grant. 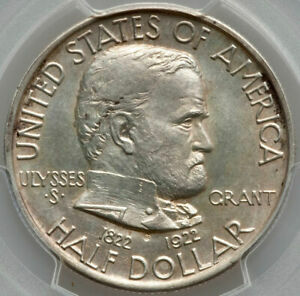 However, this was entered by mistake as Ulysses S. Grant, and eventually he chose to accept that version. He finished only 21st in a class of 39, but did distinguish himself in horsemanship and mathematics. For the next 11 years, he pursued his career in the Army with mixed success, winning two citations for gallantry in battle during the Mexican War. Tiring of postwar tedium and loneliness, he resigned from the Army in 1854. His civilian endeavors proved even less successful: Over the next half-decade he failed at both farming and real estate. He then went to work in a leather-goods business run by his brothers, and that might have been his last stop on a road leading nowhere. But the year was 1860, and events would soon alter that path profoundly. With the outbreak of the Civil War, Grant offered his services to the Union and was appointed a brigadier general with command of the District of Southeast Missouri. He justified this confidence, scoring the first major Union victory of the war when his troops captured Fort Donelson, Tennessee, on February 16, 1862. He demanded and received "unconditional surrender," giving new meaning in many admirers' minds to the "U.S." in his name. Another triumph followed seven weeks later at Shiloh, but heavy Union casualties led some to question Grant's tactics in that encounter. He lifted this cloud of doubt by orchestrating the capture of Vicksburg, the last big Confederate stronghold on the Mississippi River. In March 1864, President Lincoln promoted Grant to lieutenant general and gave him command of all the Union armies. He handled this assignment skillfully, pressing the Union's numerical advantage to wear down the forces of General Robert E. Lee, his Confederate counterpart. He accepted Lee's surrender (unconditional, of course) at Appomattox Court House, Virginia, on April 9, 1865. Six days later, Lincoln lay dead, and the presidency passed to Andrew Johnson, a Democrat who feuded incessantly with the Republicans running Congress. Grant's relations with Congress, by contrast, were cordial: In 1866, that body named him general of the armies of the United States. Soon, the Republicans saw him as a potential asset politically, and in 1868 they made him their candidate for president. He defeated the Democrats' nominee and entered the White House on March 4, 1869, at the age of 46. Grant himself was honest, hard-working and well-meaning, but the same couldn't always be said for those around him: His eight years as president were tainted by scandals and corruption, and he wrote his own political epitaph near the end of his second term when he told Congress: "Failures have been errors of judgment, not of intent." Fate frowned on Grant in retirement: He sank his capital into an investment firm in which his son was a partner, and in 1884 the firm collapsed, victim of a swindle by another partner. That same year, he began writing his memoirs, and these did much to restore both his finances and his reputation. Just two months after completing them, he died on July 23, 1885, at age 63. In 1921, a group called the Ulysses S. Grant Centenary Memorial Association was incorporated, ostensibly to coordinate special observances and monuments in Grant's boyhood stomping grounds in Ohio. These were to include the erection of "community buildings" in Georgetown and Bethel, Ohio, two towns where he had lived at various times, plus the laying of a five-mile highway from Point Pleasant to New Richmond, Ohio. To finance these ventures, the association sought congressional approval for up to 200,000 examples of a gold dollar. The bill was amended to call for just 10,000 gold dollars but also up to 250,000 half dollars. In this form, it won passage on February 2, 1922. The preparation of designs was entrusted to Laura Gardin Fraser, wife of James Earle Fraser, the artist who had fashioned the Buffalo nickel. 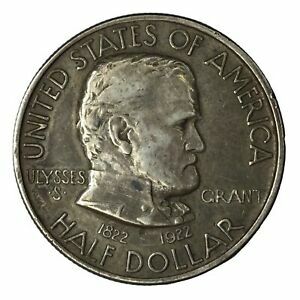 Mrs. Fraser was an accomplished medallist in her own right, having won acclaim already for her work on the Alabama Centennial half dollar of 1921. 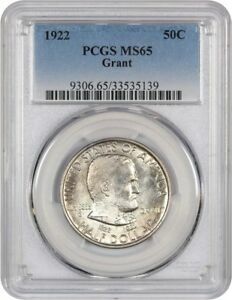 Her design was used on both the gold and silver Grant coins. 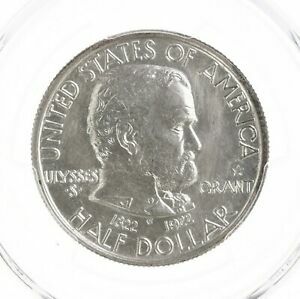 The obverse features a right-facing portrait of the general, with UNITED STATES OF AMERICA around the upper rim, HALF DOLLAR at the bottom, ULYSSES S. GRANT to the left and right of the portrait and the double dates 1822-1922 below it. The reverse shows the fenced-in clapboard house where Grant lived as a boy, shaded by a canopy of trees. IN GOD WE TRUST appears above and E PLURIBUS UNUM is broken into four lines to the left. The designer's initial G (for her maiden name, Gardin) appears below Grant's bust, between the double dates. 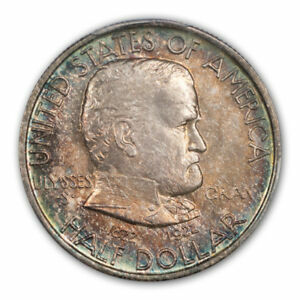 In 1921, the sponsors of the Missouri and Alabama half dollars increased their sales and profits by placing special markings on small numbers of those coins and promoting these as scarce and desirable "varieties." 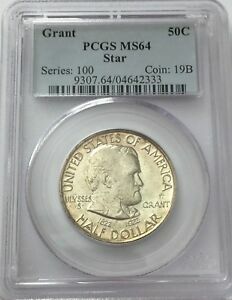 The Grant Association decided to follow suit, arranging for the placement of an incused star on half the 10,000 gold dollars. 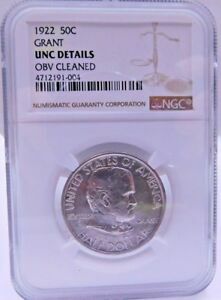 Apparently by mistake, workmen at the Philadelphia Mint also produced 5,000 half dollars with the star above GRANT on the obverse. 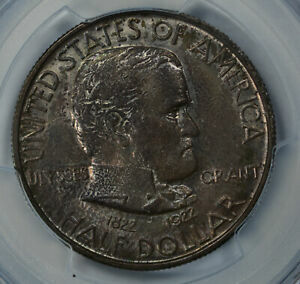 The half dollars went on sale in April 1922 for $1 each, with no extra premium being charged for the starred variety. By year's end, when the sale period closed, the distributor was asking just 75 cents apiece for the plain kind, if ordered in lots of 10 or more, but half dollars with the star had risen in price to $1.50. Sales were respectable, but fell far short of a sellout, even though actual production was barely 100,000 - less than half the 250,000 authorized. 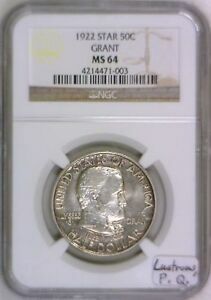 The Mint struck 5,000 Grant half dollars with the star (plus 6 for assay) and melted 750, for a bottom line of 4,250. 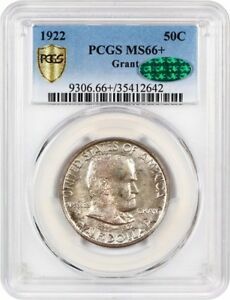 It produced 95,055 pieces without the star (the odd 55 for assay) and melted 27,650 of these, for a net mintage of 67,350. Many collectors complained about the extra variety, arguing that the star had no significance except as a marketing device. 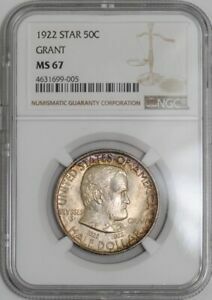 Nonetheless, it came to be accepted (and desired) as a scarce and legitimate collectible. 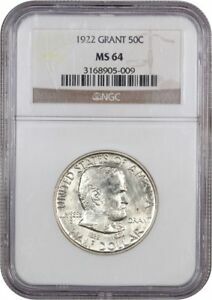 Indeed, it has long since established itself as one of the major keys among U.S. commemorative half dollars. 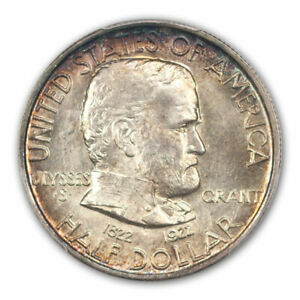 Like other pre-Depression commemoratives, many Grant half dollars ended up being spent when money got tight. Partly for that reason, they're scarce in pristine mint condition. 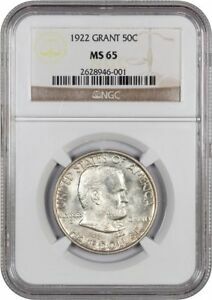 Very few have been certified in grades above Mint State-66, though they're relatively available in levels up to MS-65. At least four matte or sandblast proofs of the starred variety are known to exist, while four similar proofs without the star are reported but unconfirmed. 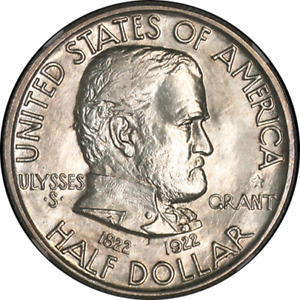 The Grant halves are notoriously difficult to grade, partly because raised die lines on the obverse look at first glance like hairlines or scratches. Points to check for wear include Grant's cheek and the hair above his ear. The reverse's dense design tends to mask imperfections and wear, but light friction often can be detected in the treetops. Die-struck and added-star counterfeits are known to exist.